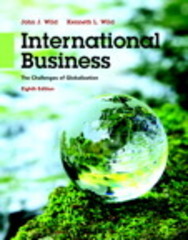 International Business 8 Edition NOTE: You are purchasing a standalone product; MyManagementLab does not come packaged with this content. If you would like to purchase both the physical text and MyManagementLab search for ISBN-10: 0133973026 /ISBN-13: 9780133866247. That package includes ISBN-10: 0133866246/ISBN-13: 9780133866247 and ISBN-10: 013386703X/ISBN-13: 9780133867039. The material has been thoroughly updated based on both reader and instructor feedback and ongoing changes in the international business world to ensure that it remains up-to-date and well received by audiences. Focusing on relating major concepts to concrete examples, this hands-on text is highly relevant to a future career as a global entrepreneur.